I have a confession to make. Don’t tell anyone I told you this, but I’m not a fan of St. Patrick’s Day celebrations. When I was a kid St. Patrick’s Day (like every holiday) was kind of a big deal. I made sure to wear green – and delighted in pinching those who didn’t. My Grandmother would make corned beef hash and tell us about her parents who emigrated to the U.S. at the dawn of the 20th century. My mother would go over the genetic math for us, reminding us that Grandma is 100% Irish, she and her sister are half-Irish, and that means that my brother, sister and I were each “one-FULL-quarter Irish” (her words). Then as time passed, I kind of just lost track of St Paddy’s day. I know its in March… Is it the 14th? Is this shirt green? Well it’s green-ish and it’s clean-ish so it will have to do. That’s the level of reverence I’ve been giving to St. Paddy’s since roughly ’09. In my own defense, the way the holiday is celebrated in the US has not aged well. For starters, associating St. Patricks Day with leprechauns and getting blackout drunk is an insensitive caricature of Irish culture. In TV and radio ads, exuberant marketing hacks compete for phoniest brogue as they implore us to ‘save a pot-o-gold’ on a new Hundai or mattress or whatever. I say thanks, but no thanks to all of that. So maybe you can understand how surprised I was as I walked up the Mile on my way to the Miracle Theater to catch the 8pm showing of ‘Once’ this past Saturday, to realize it was in fact St. Patrick’s day. Well ‘day’ is a stretch, as it was nearly 7:30pm already and my first clue as to the rapidly diminishing holiday was two men sitting across from one another at an open-air table on the Mile. The men sat silently staring down at their food. Occasionally taking very small somber sips of green beer. That’s when I remembered the play I was headed out to see: Once, is set in Dublin. I had no idea that I was about to luck my way into a real St. Patrick’s Day like I hadn’t had in years. Entering Coral Gable’s historic Miracle Theater always makes me feel lucky that I live in a place like this. It’s one of many places that makes Coral Gables feel like a legit town to me. Miracle Mile is more than just Starbucks and California Pizza Kitchen, because it has a goddamn theater. As showtime was fast approaching people were hustling past the lit up marquee to get in and find their seats. As I entered the large auditorium, I could see that the scenery set up on stage for the play included a fairly elaborate bar. To everyone’s surprise, there was even a guy on stage tending bar, and everyone was invited to walk up on stage and get served a drink! While I wasn’t in the mood for a drink (much less wait in line for one), I still jumped at the chance to get up on stage and check it all out. There were musical instruments all over the stage: guitars, mandolins, banjos, piano, accordion. All of which made me remember the music from Once. Until that night, I had never seen Once onstage. I saw the 2007 film shortly after it came out and immediately feel in love with the soundtrack. The music from the movie was written by the film’s stars: musicians Glen Hansard and Marketa Irglova. A few years back you couldn’t set foot inside a Publix without hearing the gentle tones of their smash hit “Falling Slowly”. It was getting to be 8pm and the line at the onstage bar was still pretty long. I overheard a crew member say something into his radio headset to the effect of ‘the line’s still pretty long… can we get this guy some help”. I was wondering how they would ever get all these people back on their side of the 4th wall. Just then suddenly four men, who I thought were part of the crowd, erupted into song. Irish song – full of cheerful melody, clever harmony, foot stomping and bawdy innuendo. Just as they finished the first chorus of their tune, they were joined by two women each brandishing a soaring bow across fiddle. One of the women took over as the lead singer and one of the men began banging out lively rhythm patterns on a cajon. Some of the others took up the guitars and banjo and all of a sudden I realized THIS WAS THE SHOW. The show had started and we were all in it. The musicians were excellent. They sang tune after tune, each more elaborately harmonized and dynamically arranged that the last. 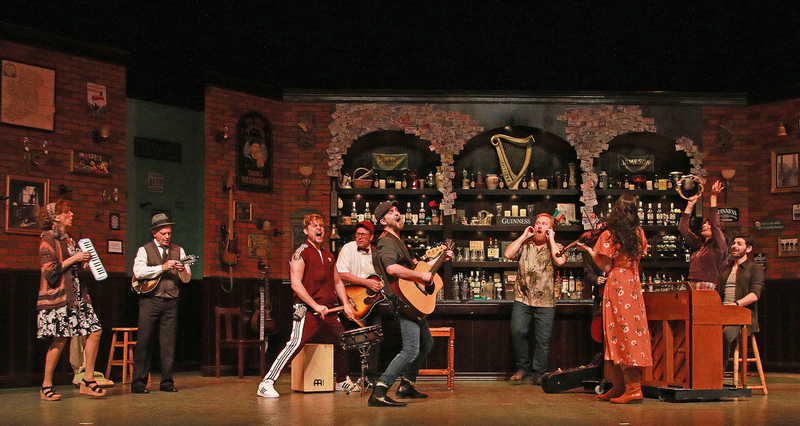 These were not the modern folk-pop songs of the show Once, they were traditional Irish folk tunes. And the way these musicians played them was simply stunning. They audience started clapping along to the beat. The musicians themselves danced as they sang and played. One of the fiddle players leaned over to delight a little girl who was carried onstage by her mother. I don’t know how they did it, but as they played and played people started taking their seats and before you knew it the play had begun. It was truly one of the most fun ways to open a show that I’ve seen. I wondered how the show itself could top this set of opening numbers. The show itself, however, certainly did not disappoint. The stage show Once differs significantly from what I remember of the movie. While the movie has some funny moments it is a little more bleak and moody. The stage show seemed intentionally more comedic. I felt some of the jokes worked and some kind of didn’t. But the actors committed and the audience responded enthusiastically to just about all the jokes. The music, on the other hand, sent me over the moon. This show has so many truly great songs. Ben Hope delivered a gut-wrenching bare bones rendition of “Leave” at the opening of Act 1. Co-lead Elizabeth Nestlerode treated the audience to a brief display of her dazzling pianistic chops with a charming bit of Mendelssohn before teaming up with Hope for the afore mentioned “Falling Slowly”. Other greats included “Say It to Me Now”, “If You Want Me”, and “When You’re Mind’s Made Up”. In contrast to the pre-show folk tunes, the Hansard/Irglova songs that make up the show Once aren’t exactly Irish, except that they are. They represent a more contemporary Ireland: a place that has become cosmopolitan and plural while retaining a heritage full of pride, sensitivity, love, life and humor. I can’t think of a better place I could have accidentally spent my St Patrick’s Day. I highly recommend you catch this show while you still can.